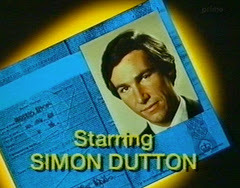 The Brazilian Connection is another of The Saint TV movies, featuring Simon Dutton as Leslie Charteris’ character, Simon Templar. This isn’t really a spy film, but The Saint does come up against an international ring of black market baby traders. They are hardly SPECTRE or THRUSH, but they are pretty despicable people and must be stopped. I have included this review as a companion to some of the other Saint reviews that I have posted, which do cross into espionage territory. This production has a terrific opening sequence. I can see why it was chosen to be the first in this series. It opens with two thieves climbing a staircase to the top of a multistorey building under construction. These crims have just stolen a priceless jewelled Russian tiara, and waiting on the top level is their fence who will ‘move’ the stolen goods. As the exchange is about to take place, The Saint alights from the elevator. He confidently walks over and picks up the tiara. The crims are baffled. Who is this guy? One of the thieves pulls a pistol from his jacket and is about to shoot The Saint, when Templar announces that they have exactly 55 seconds until the police arrive. And arrive they do. A whole squad of police officers starts milling around at the base of the building, before proceeding to move up the stairs. The crims begin to panic. Templar makes a suggestion – he’ll take the tiara. That way the police will have no evidence to arrest the crims. But the three crims can’t decide what to do. As The Saint nonchalantly counts down to the police’s arrival, the crims begin to fight amongst themselves. The fence tries to run off with the tiara, but the other two chase and pull him down. At that moment the police arrive at the top. They arrest the three crims as they wrestle on the ground, and then retrieve the case that the tiara was in. Not surprisingly, the case is empty, and Templar is nowhere to be seen. When one of the crims starts babbling about a fourth man who has disappeared into thin air, the police are sceptical. All except one. Claude Teal (David Ryall) has seen this sort of stunt before, and he believes it is the work of The Saint. When we next see Templar, he is travelling away from the scene, riding on the hook of a giant building crane. It’s a good opening scene and showcases the one thing that I liked about The Software Murders, which I reviewed last week – and that is that The Saint is a criminal. He’s not a malicious cold blooded killer, or anything like that, but none-the-less he is a privateer. The Saint’s next port of call is Knightsbridge. Exiting a shop, he holds open the door for a lady, Jenny (Jennifer Landor) pushing a pram. The pram is adorned with an American flag. Templar and the girl engage in some innocent banter, before Templar moves on. Next he goes into an art gallery in Knightsbridge. The gallery is showcasing exquisite ancient Chinese ceramics valued at tens of thousands of dollars. Templar drops and breaks a few of these rare treasures, shocking the curator and the buyers gathered in the gallery. Then he denounces the vendor as a fraud. The vendor tries to leave rather hastily, but Claude Teal from Scotland Yard enters the door and blocks his escape. Meanwhile, outside Jenny enters a shop to buy a magazine. She is a nanny looking after the five month old baby inside the pram. Accompanying her is the babies mother. As jenny makes the purchase, the mother stands watching the pram. At that moment, one of the mother’s friends passes by. For a split second ‘mum’ takes her eyes off the pram to talk to the friend. When she returns her gaze, the pram and the baby have disappeared. Templar is still in the gallery tying up loose ends. From the second floor window he notices the pram going by in a different direction. He recognises it by the miniature American flag. He also notices that it is being pushed by a different man and woman. Then as he leaves and is out on the street, he see this ‘new’ couple driving off in a small van. Adorning the sides and rear door of the van is a logo depicting the Aztec God Quetzaquotal. Once information about the baby napping reaches the media, and Simon realises he can help, he approaches Jenny. Initially she is sceptical, wondering what is ‘in it’ for The Saint. He soon convinces her of his good intentions. This entry in The Saint series is so much better than The Software Murders. Sure it is still encumbered with some of the same problems as The Software Murders, such as a gritty low budget look, and a dreadful score by Serge Franklin. But this production has a decent plot, courtesy of Anthony Horowitz. The script not only has a good central plot, but it also features some great interplay between Teal and Templar. The Brazilian Connection is far from perfect, but this time I’d have no hesitation in recommending it to Saint fans. It is fast paced, and even though the production isn’t action heavy, it has good and engaging dialogue.